This set of Tough Concrete Technology Interview Questions and Answers focuses on “Sulphur Infiltrated Concrete, FRC”. Explanation: Cement with composition has very good resistance to sulphate attack. This type of cement is used in the construction of foundation in soil where subsoil contains very high proportions of sulphate. 5. Which cement is used to store for longer duration in wet climatic conditions? Explanation: This Cement is produced by adding 5- 10% mineral pigments with Portland cement during the time of grinding. 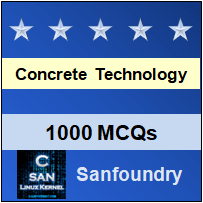 To practice tough questions on all areas of Concrete Technology for Interviews, here is complete set of 1000+ Multiple Choice Questions and Answers.